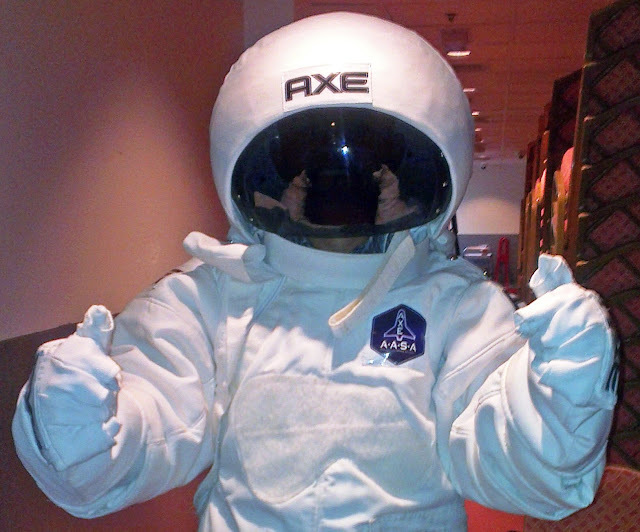 Axe is recruiting a few brave civilians for the opportunity of a lifetime - a trip to space. As in, actual space. "Space travel for everyone is the next frontier in the human experience," Buzz Aldrin, who became the second person ever to walk on the moon during NASA's 1969 Apollo 11 mission in 1969, said in a statement. "I'm thrilled that AXE is giving the young people of today such an extraordinary opportunity to experience some of what I've encountered in space." Arriving from Dubai International Airport Terminal 2 around 1200H, waited for more than an hour for a Hotel Representative to fetch me up. Good thing I have roaming signal to follow-up my status as I'm starving and bored. After numerous exchanged of sms and calls, finally I've reached the hotel around 1400H. Again, there was some misunderstanding about the accommodation as it was initially charge to our personal account as per hotel's reservation staff. I've called again to clarify the details of it and finally resolved after less than hour including the lunch as there were only few minutes to pick us up going to the place of event. Though this experience in Dubai somewhat a little bit discomfortable (I've been in this city for three times), I still felt disorientated about what will happen next. Anways, around 1645H, we're on our way to Royal Ballroom, Royal Mirage, One & Only Hotel. We arrive in the Royal Ballroom with some staff still fixing the set. We met our Organizer and toured around the area, this was the time also to know my fellow participants and our individual stories how we enabled to get here. Briefed about the program and advised about the rules and regulations. 8 contestants from the Gulf Region will fight for a chance to fly in the outer space. This 8 contestants is subdivided into two groups that will fall under location category, Team Gulf (composed of 2 from Kuwait & 2 from UAE) and Team Egypt (3 attended, I did not know what happened to the other one). Remember, there can only be two winners. This 2 winners will each come to represent this two groups. To my surprise at this moment, I was the ONLY Filipino / non-Arab out of 8 participants who advance in Axe Apollo Middle East Grand Finale. In this regard, I felt already a winner. Not just representing the entire Filipino Traveler community in the Middle East but to prove or challenge myself beyond my limits. I have strong feeling of inferiority complex, and my first time to join a very well-known competition that has been watched by a crowd with no single person knows me. Indeed an overwhelming one-of-a-kind experience. Dealing with gravity is a big part of becoming an Astronaut. We have to jump on a giant trampoline wearing an almost actual weight of a space suit. Then, we have to grab floating cans of Axe Apollo as much as we can in 10 seconds. We have to pedal for 10 seconds on a stationery bicycle connected to a digital projection of a heart. The heart is empty but starts to fill-up as we pedal away, to prove that we've got the natural stamina that a girl's heart desires. After completing the game 1 and game 2, scores will be tallied and the 2 topmost participants will advance to Game 3. Those who will advance to Game 3 will be asked 3 questions by the judge - Miss World 2012 2nd runner-up (also Miss Australia 2012) Jessica Kahawaty. They need to prove how skilled they are at charming the ladies. I did not advance to the final round. For me, accomplishing the challenge successfully infront of people was already an achievement. In addition, fellow participants did well enough than me so I absolutely respected whatever outcome it may have tonight. After around an hour the 2 winners have been announced officially; from Team Egypt is Ahmed Khaled Saeed while Ahmad Haggagovich for Team Gulf. Part of the Jury is DJ Bliss, the man behind the AXE Apollo Middle East Campaign. From Unilever Team, Mr. Abdullah Aboughali, GCC Brand Manager of Oral Care & Deodorants. And finally, Miss Jessica Kahawaty, Miss World 2012 runner-up. This event is hosted by Hassan Al-Sheikh from Star FM. After Event party includes bottomless cocktail drinks to the beat of Electronic Dance Music and socialization with the whole party attenders on the spirit of Axe effect. All astro-finalist received voucher of 1-hour relaxing massage in Media Rotana Hotel. Thank you to my fellow finalist, Thank Axe Apollo Middle East Organizers, you all made my night.